Exclusive hand-cut, hand-blown, 24% full lead crystal 32 oz. Exception style Decanter with Stopper and two 11 oz. 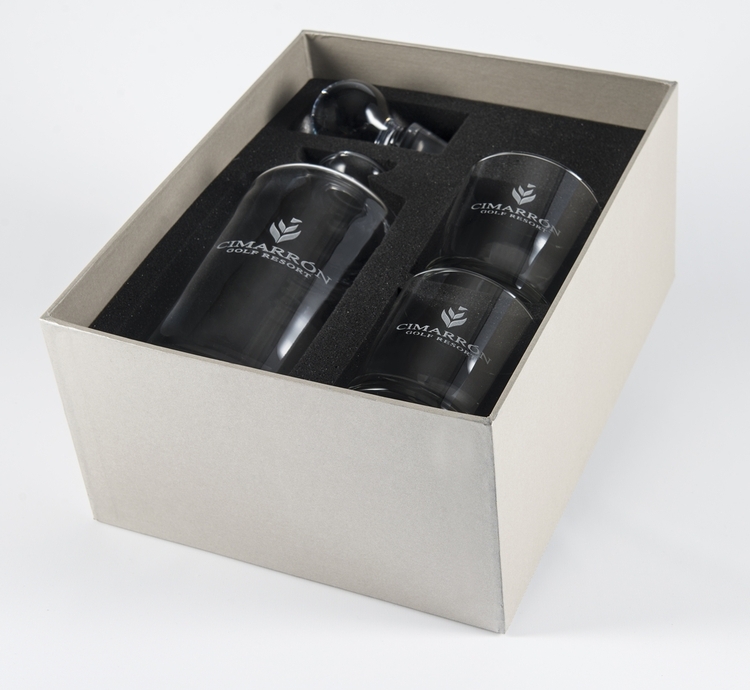 Exception On-the-Rocks Glasses in a new designer gift box for an elegant and memorable gift set. Prices include deep etch engraving or monogramming on each piece. Please note that the nature of hand-blown hollowware often produces bubbles and other imperfections and are not considered defects. Not dishwasher safe. IMPRINT: Deep Etch Imprint 2.25"h x 2.5"w on Decanter & 2"w x 1.5"h on each glass. NOTE: 24% Full Lead Crystal, hand-blown and formed by hand. Expect minor bubbles and swirls that are inherent to full-lead crystal. Full-lead crystal ranges from colorless to a subtle blue tint. Dimensions and weight will vary from piece to piece. Excellent sparkle. Glass will ring when pinged. Larger pieces in this category are exceptionally heavy due to lead content. Variations will occur on styles with hand-cut patterns due to its hand-crafted nature. Not suitable for hot liquids.